No matter how you feed your budgies, at some point you probably end up with a bunch of seed hulls. Mixed in with those seed hulls are unwanted seed and maybe some pellets, dried fruits and veggies and herbs, depending on your preferred brand of parakeet feed. There’s no need to throw those discarded seeds right into the trash. Here are a couple of ways to extend their life. Use them as a fun enrichment. 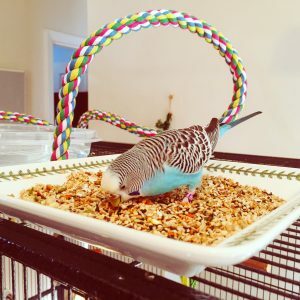 I feed Toby and Kelly 2 tablespoons each of a mix of the following every morning: Dr. Harvey’s parakeet blend , Volkman Avian Science Super Parakeet and Harrison’s High Potency Super Fine Pellets . Even though it’s only 2 tablespoons per day, there’s always some leftover. They especially do not like the sesame seeds in the Dr. Harvey’s, and they are still getting used to the pellets. 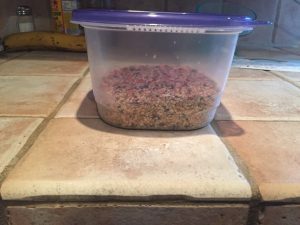 So, every morning when I refresh I put the leftovers into a Tupperware container that I keep on my kitchen counter next to the seed mix. There’s still a ton of great stuff in there! So, I use it as an opportunity for foraging enrichment. Either I pour some on top of a fruit or vegetable I’m getting them to try, or a little bit on a flat plate really gets them excited. For a super fun Saturday I pour a good 1/4 inch onto a plate and let them go crazy. They really love digging through the discards and finding delectable morsels they missed the first time around, and I love getting just a little more use out of the good quality food I spent my money on! When you are truly done with the discards, throw what you’ve collected over the week outside for the outdoor birds and squirrels. I have two squirrels right now in my backyard digging through my budgies leftovers. It’s winter so I’m sure they are happy to have the little bit of extra food. Soon the birds will come and pick through the rest. What my picky eaters are too good for turns into a treat for wild birds. I’m sure it doesn’t mean much to them, but in a “waste not want not” kind of way it makes me feel good not to put usable seeds and pellets into the trash. Does anyone else use their discarded seeds and hulls for anything? If you’ve got ideas I’d love to hear them! Otherwise, if you’re throwing out uneaten seeds on a regular basis I hope you’ll consider saving them for foraging, either for your budgies or the outdoor birds. they’d dive bomb it and scatter them all over. I should probably edit to add that there may be some extra clean up required post-enrichment! Usually if I use the plate pictured, with the sloping sides, it doesn’t make too much extra mess unless there’s a lot of flapping going on! The thought of the chaos happening with my birds was just amusing! I’m always feeling a little guilty about waste, too. One caveat, from my own experience. I decided that I’d save excess, leftover and picked through seeds and give them to the wild birds outside. Why buy birdseed when I had all of these leftovers, right? Well, not even a whole week into it, I noticed *mold* growing on the seeds! So, I nixed that idea. Doesn’t sound like you’ve run into that problem, but you might want to keep an eye out for it. Yikes! Thanks for the heads up, I will definitely keep an eye out, I don’t want to feed mold to the outdoor birds. Right now it’s so dry where I am I don’t think the mold would have a chance! Previous Previous post: Bed time is a total nightmare with three budgies! 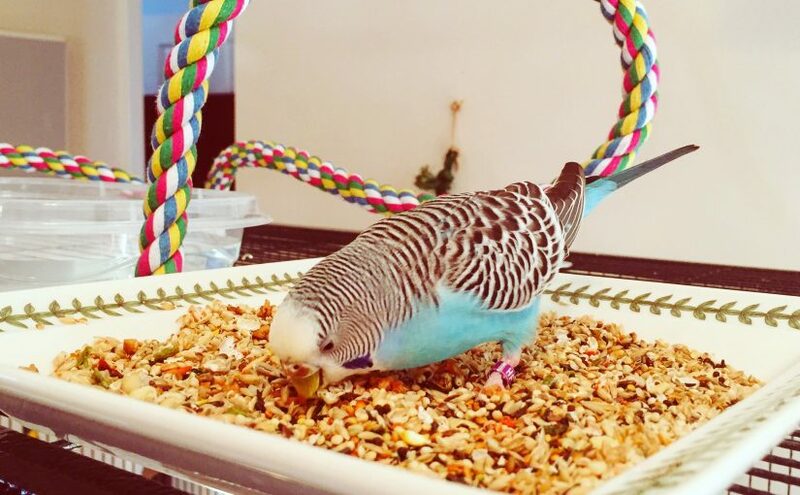 Next Next post: Parakeet weight update – have Toby & Kelly slimmed down?